When Sonny Emory first started to play professionally, endurance wasn't his strong suit. After just a few songs, he'd be snoozing on the backstage sofa, exhausted by a single set of jazz drumming. He was six at the time. In the decades that followed, Emory worked with Earth, Wind & Fire, Steely Dan, the B-52s, Jennifer Lopez, Bruce Hornsby, Paula Abdul, Stanley Clarke, Boz Scaggs, and many others. He currently plays a long-running gig with Bette Midler at Caesars Palace in Las Vegas, records and tours with Bruce Hornsby, and gigs with his own group, State of the Art, when he's home in Atlanta. Sonny credits his early start to the support of a musical family. "My grandfather sang and played piano and uke. My mom is a singer. My father plays all the saxes and several brass instruments. He was active in the Atlanta jazz scene, and I used to play the first set with him when I was six or seven. He introduced me to a lot of great musicians at an early age. It was a cool experience." Sonny's parents were also educators--his mom an early childhood specialist, and his dad a public school band teacher. They urged him to get a formal music education, and he took their advice, earning a degree from Georgia State. "Lou Rawls asked me to tour with him when I was 17, but my parents were sticklers about me staying in school," recalls Sonny. 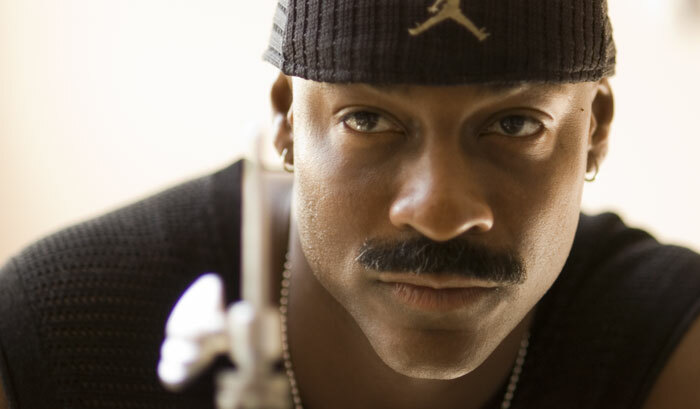 "My mom let me tour with Cameo when I was 19, even though I was in summer session at Georgia State. But I wouldn't have dared to ask if I could tour during the regular school year!" After completing college, Emory moved to Los Angeles, where he played with Joe Sample & the Crusaders before serving a 12-year stint with Earth, Wind & Fire. In 1996, EWF's Maurice White produced Sonny's first solo album, Hypnofunk. "He walked me through the entire production process, so I was taught by one of the world's greatest," says Emory. What did he learn? "First of all," replies Sonny, "you can't rush creativity. You have to let the songs come to you as they come to you. You may have 25 or 30 ideas, but only ten may, as Maurice would say, 'stand up.' Everybody has creative lulls, those periods when you have no inspiration at all. Then there are other times when you have so many ideas you can't get to the studio fast enough. You have to let creativity find its own cycle." 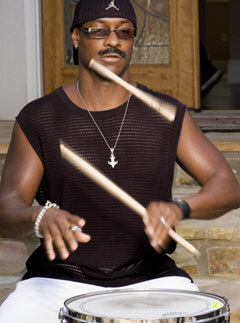 Emory is a longtime Yamaha drum user. "All of my kits are Yamahas," he says. "I have a Maple Custom kit, a Recording Custom kit, an Oak Custom kit. But now I'm stuck on the new Phoenix kit. You get incredible fundamentals from its toms and kick drum--it's the purest tone I've heard from a drum in a long time. It's amazing how Yamaha has raised the bar. I'll put any drum on the planet up against these drums." 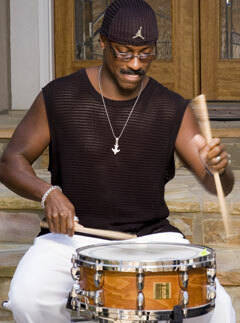 Sonny has also collaborated with Yamaha on two signature snares. "The first time around, we wanted to build a powerful drum for playing funk," he explains. "It's a beech drum with a hard, fat tone. You can crank it up high without losing the mids and bottom, and when you tune that bad boy down, it's just incredible. Now we're working on something different to add to the arsenal. This new snare will by 5.5" by 14", with some piccolo characteristics. It has a continuous slit around the middle, because I believe that the more air that escapes, the better." Perhaps unsurprisingly, given his upbringing, Sonny is passionate about music education. He teaches part-time at Georgia State and hosts the annual, all-ages Sonny Emory Drumset Camp. He says he's inspired by the fresh energy and ideas of young players. It's amazing how Yamaha has raised the bar. I'll put any drum on the planet up against these drums. "Their greatest strength is their creativity," he observes. "But the flip side of that coin is whether all their creative ideas fit into the music they're playing. A lot of players need to learn to be more disciplined about what they play and when they play it, and not just blaze away. Basically, they need to become better musicians. I encourage them to learn the piano, study harmony, and learn music theory so they can talk intelligently with their bands. But most of all, they have to fall in love with the sound of a band that grooves as a whole, where everybody contributes what they should and nothing more. Once everybody in the band does that, it creates a space where the magic begins."